Once a year, the Atlanta Botanical Garden opens it gates to visitors of the four-legged variety…and they arrive in droves, dressed funnily, but the come. 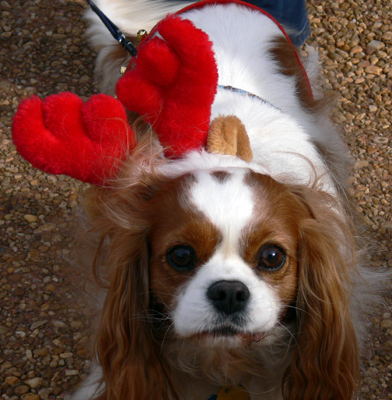 The event: The Annual Reindog Parade. And there's a lot more going on in the garden this time of year! I arrived at the Garden not sure of what to expect. Excitement is what I found. 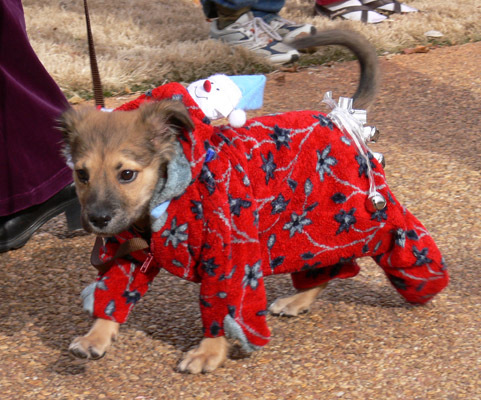 There were couples, families, dog-lovers of every variety and dogs of every breed homing in on the Great Lawn to view or participate in the Reindog Parade. The Master of Ceremonies for the Parade was Victoria Stilwell of Animal Planet's TV show "It's Me or the Dog." Starting just after 11 a.m., practically on time, Victoria was the perferct choice to lead this event...entertaining and humorous. Even though I don't have a dog, the event was great fun. The doggie costumes were creative, clever and celebrations of the season. And there was every interpretation of the season you can imagine. 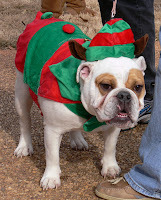 From a bulldog donning a red and green tutu to the cast of "A Christmas Carol," it was as the Garden advertised…"a doggone good time." Tiny Tim, a three-legged rescue dog and a contestant in the Best Dog Pack category, put the votes over the top to win Best-in-Show with his canine buddies Scrooge and Ghost of Christmas Past. This was the first time I've ever seen a Santa, or Old Saint Nick, visiting with kids in the outdoors…and it was amazing. It totally makes sense, too. 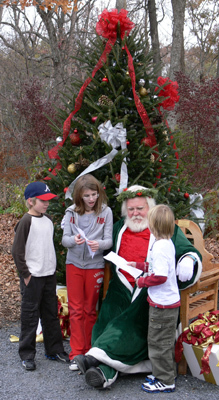 When Santa first started seeing kids, there were no shopping malls in which to perch. The natural setting and evergreen headdress provided by the Atlanta Botanical Garden added a touch of unexpected splendor to the Saint Nick experience. Unfortunately, if you weren't there on the day of the Reindog Parade, you'll have to wait until next year to see the Garden's Saint Nick. The one (almost) exception is Santa's Missing Mail, an annual all-ages puppet show. The final performance is this weekend on Saturday, December 18 at 10:30 a.m. The Atlanta Botanical Garden's Holiday Model Train Show takes me back to simpler times when wonder was indeed wondrous. I had trains when I was a kid and seeing the Garden's trains gave me the same excitement that the Garden’s visiting kids obviously felt—"Look, Mommy!" exclamations with pointed fingers or a intent gazes while daydreaming of what the future may bring were the order of the day. You can walk over and around the display to see the four trains on multiple tracks. And keep an eye out for the Grinch and the "reinflamingos." Be sure to walk over to the nearby model train sitting atop the fountain in the Cox Courtyard of GardenHouse. Its Coca-Cola Bear passengers are having a blast! The Model Trains are part of Holidays in the Garden, so they'll be departing on January 2. For safety reasons, they will not operate in inclement weather…just like in real life. Children visiting the Atlanta Botanical Garden on weekends this month will certainly want to take a ride on The Botanical Express. The brightly colored train is kid-size and travels around The Great Lawn, just in front of the Fuqua Conservatory. The last train departs on January 2 and tickets are $2. Be sure to check the train schedule to make sure you arrive on a day when your little Johnny or Susie can participate in this great train adventure. The Chocolate: Seed to Sweet exhibit has been ongoing since September and wraps up on January 2. Sprinkled with special chocolate events, the one that most catches my eye, and is coming up next weekend, is the Chocolate High Tea, scheduled for Sunday, December 19, 2010. A classy little escape from the world…and it features chocolate! The Fuqua Conservatory, home of the Garden's tropical and desert collections, is decked out for the holidays. I've never seen so many Poinsettias in one place, let alone a Poinsettia tree three times my height. 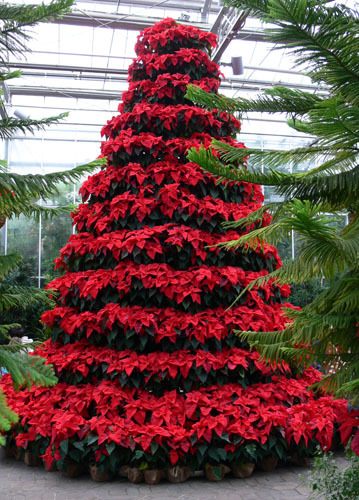 I just learned that the Poinsettia is not indigenous to the United States. It was brought to the United States from Mexico by Congressman/Ambassador Joel Roberts Poinsett. Oh, the things you learn through being a tourist! You may wonder "Why in the world do I want to go to the Garden in the middle of winter?" The answer, my friend, is simple. It's beautiful…it's relaxing…there is lots to do…it's easy to get to…it's unique…it's in bloom! In addition to the Garden's many activities and events, its incredibly diverse collection has specimens that are in bloom every month of the year. Basically, the Garden is always in bloom…through plant life, art in the garden, staff botanists and volunteers and, of course, its visitors. Will I return to the Atlanta Botanical Garden, specifically the Reindog Parade? The Garden has long been a personal favorite, but I've never had a dog of my own…I had cats growing up. But, after seeing how much fun these little doggies were having and the joy they brought their human companions, I have to admit that I have a touch of doggie fever.